IGF1 DES Peptide Magnus Pharmaceuticals (1-3) is a truncated variant of the conventional one of the IGF1 DESPeptide Magnus Pharmaceuticals with a so-called tri-peptide structure. It has been specifically isolated, so that it can exert its effect in certain types of tissue. Due to the altered structure, IGF1 DES Peptide MagnusPharmaceuticals (1-3) peptide affects the hypertrophy and proliferation of so-called satellite cells in the muscle tissue and other tissues ten times as much as IGF-1. In addition, it is to be significantly more metabolic, ie more fat-burning, than conventional IGF-1. The effect of IGF1 DES Peptide Magnus Pharmaceuticals (1-3) is four times faster than that of conventional IGF-1, with the fat-burning effects also lasting three to five times longer than that of conventional IGF-1. This is due to the fact that IGF1 DES Peptide Magnus Pharmaceuticals (1-3) is located in the target tissue at a higher concentration than IGF-1. Originally, IGF1 DES Peptide Magnus Pharmaceuticals (1-3) was produced for severe inflammation and intestinal disorders, as it specifically strengthens intestinal tissue. In addition, IGF1 DESPeptide Magnus Pharmaceuticals (1-3), like other forms of IGF-1, is used in the treatment of catabolic effects in general or by certain diseases. It has also been shown that IGF1 DES Peptide Magnus Pharmaceuticals (1-3), compared to IGF-1, has one to three times greater effects on the growth of tissue, predominantly muscle tissue. Wound healing is also greatly accelerated. IGF-1 DES has many properties of growth hormone HGH. Studies have even shown that IGF1 DES Peptide MagnusPharmaceuticals not only promotes the new formation of muscle cells, as in HGH, but also the division of new and existing cells, which is also called hyperplasia, and leads to the growth of the divided cells and new ones Muscle mass forms. As a result, the muscular density is radically increased, which can also be seen in some top bodybuilders, as they are lighter compared to many others, but they look 15Kg heavier due to the impact. 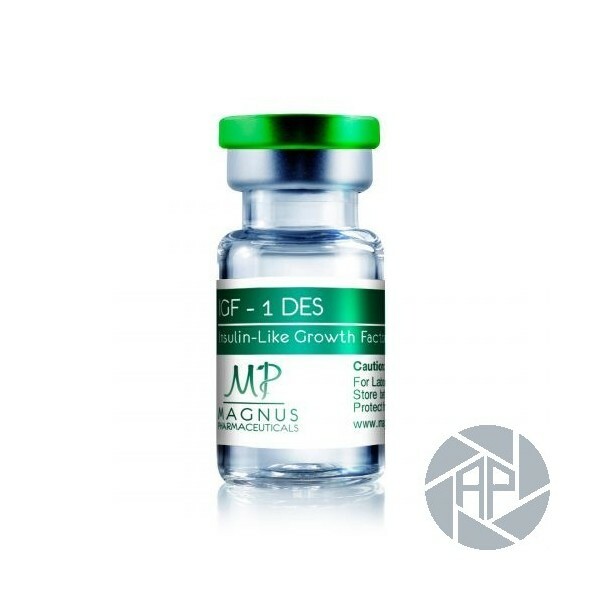 IGF1 DES Peptide Magnus Pharmaceuticals is supplied as a freeze-dried powder in the glass vial. This still does not have to be cooled. 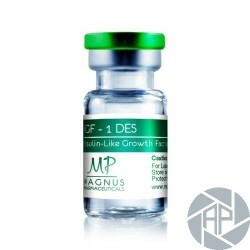 To your IGF1 DES Peptide Magnus Pharmaceuticals with 1mg of active substance add 2ml parenteral water to the vial. Now you have 2ml with 1.000mcg of active ingredient. 1ml with 500mg of active substance = 0.1ml with 50mg of active substance. The final peptide is injected with insulin injections. The now ready-to-use IGF1 DES Peptide Magnus Pharmaceuticals active ingredient (liquid) can now be stored in the refrigerator for weeks as described on the packaging.